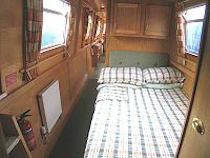 Design : The Alvechurch Warbler is a 69ft long, 8 berth semi-traditional stern narrowboat. It has a quiet water-cooled diesel engine with simple to use controls. Features : Full radiator central heating. 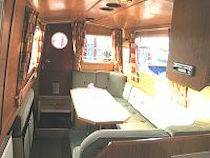 Spacious saloon with a sofa and removable table. The seating can be converted into a double bed in the evening, if required. 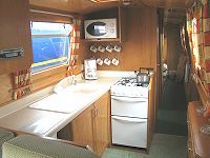 Kitchen : Well-equipped galley with 4 burner gas cooker complete with grill and oven, refrigerator, sink and drainer, work surfaces and storage space. There is a cafetiere, toaster and microwave in the galley. Sufficient saucepans, cooking utensils, crockery and cutlery etc. for the number of berths. Bathroom : Two bathrooms, both with a wash basin, flush toilet, and shower with bi-fold door. There is also a 240v shaver socket. Larger Mirrors. Additional Information: Front deck table. Tuition, and buoyancy aids, are supplied free of charge.